So those of you that have read this blog before have probably seen My Journey. The Basics- I am a former USS level swimmer turned collegiate swimmer then turned lazy heavy woman reformed to a triathlete. When I entered the world of running and ultimately triathlon in 2009, I was interested to see a division known as Athena. At the time Athena rules were any woman 150lb or more could compete in this division, the rules have now changed to 165lb or more. I competed in my first triathlon in Athena taking 2nd in the division. 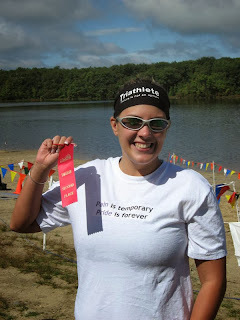 I continued my triathlon obsession in the 2010 season with a few aquabikes and a sprint after having hip surgery in April 2010. In 2011 I had a full season with the top off of my first half ironman. As I trained I think I just ate whatever I wanted and my weight stayed constant even with the amount of training I was doing. In 2012, I did 2 half iron distance races, this time I got overly conscious about what I was eating and I don't think I fueled enough! As 2013 started I decided to get my act in gear and track my calories with my workouts and try to be sure I was fueling enough and not too much! This lead to a 20lb weight drop. As the season has progressed I have continued to drop weight and depending on your scale I am no longer eligible for the 165lb Athena division. At my first 5k in 2009. In the 2010, 2011, 2012, and start of 2013 season I competed in Athena when it was available though some races didn't offer it and in those cases I competed in my age group. At some of those races I was fortunate enough to win my age group and more times than not I was on the podium in the Athena division. Sometimes the Athena division was more stiff competition than my current age group, I distinctly remember finishing some races being 3rd Athena but I would have won my Age Group. Since in Athena you compete against everyone, no matter age, that meets the weight requirement. 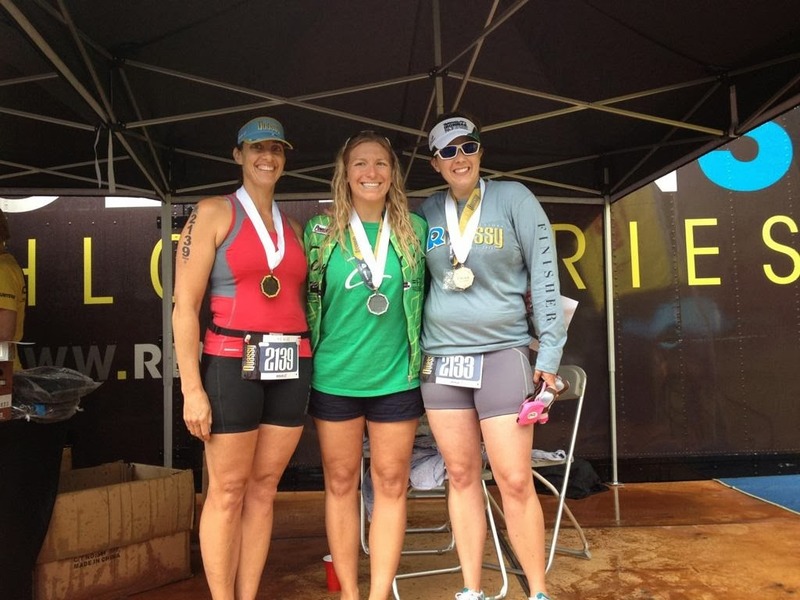 I have seen Athena as a great stepping stone to get me into triathlon. 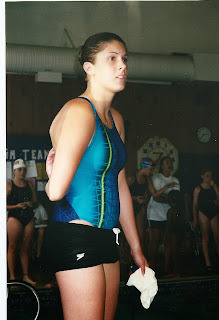 It offered a way for me to compete and gain confidence in the sport. As I have dropped weight my speed has improved. I have worked hard to gain speed on the bike and after the years of weight struggles I am seeing the gains in my run times. Athena offered me the same comfort many people get with a Newbie wave at their first triathlon. I see it as with Newbie waves , Athena is not meant to be competed in forever. I see it as USAT offering a less daunting, less intimidating way to compete in a sport that is flooded with women with 10% body fat. Interestingly enough Caroline Steffen who came in 2nd at Kona this year is 5'10" and 150lb- so by the old standard she would be an Athena! Athena women have become a group that can be very judgmental at times but at times they are a great support network for the women looking to overcome the intimidation of the sport. The group can have a mean girls mentality at times, being judgmental of those that are not really Athenas. I think the group should offer support to the ladies who want to compete and not judge others who may not weigh exactly 165 on race day. And further more be understanding that you are the minority- and USAT, fitness companies, and other organizations can not function on the needs of the few outweighing the needs of the many. I was registered to race Athena at a race in Sept. I received an email from race organizers reminding me of the change in the weight classifications and letting me know I could change to age group competition if I no longer met the rules. I chose to change to Age Group competition because as I said depending on the scale I may not make the 165lb cut off. When I arrived race morning to rack my bike I was confronted by a woman who was registered Athena, since I was originally registered Athena I was racked near them. She was sure to ask if I would be competing Athena. I assured her that at packet pick up I had changed my registration to Age Group. This is not the first or the last time I have seen this happen to me and other women. Come on Ladies the world is judgmental enough why do we have to judge fellow triathletes?! To be honest- I couldn't be happier to be no longer eligible! I am getting closer to what I used to look like at 16 when I was swimming 6 hours a day. Jillian Michaels said something when I went to see her Unlimited tour that stuck with me- if you are overweight and say you are happy you are lying to yourself. The more and more I see my hard work pay off the more and more I see that as TRUE! So get out there and test yourself in your Age Group. See what you can do. Hell I qualified for USAT Nationals for 2014 in my Age Group. Test yourself to try to be the best you you possibly can be and PLEASE stop judging others because you don't like it when you get judged!